In organic chemistry, an alkene is an unsaturated hydrocarbon that contains at least one carbon–carbon double bond. The words alkene, olefin, and olefine are used often interchangeably (see nomenclature section below). Acyclic alkenes, with only one double bond and no other functional groups, known as mono-enes, form a homologous series of hydrocarbons with the general formula CnH2n. Alkenes have two hydrogen atoms less than the corresponding alkane (with the same number of carbon atoms). The simplest alkene, ethylene (C2H4), with the International Union of Pure and Applied Chemistry (IUPAC) name ethene, is the organic compound produced on the largest scale industrially. Aromatic compounds are often drawn as cyclic alkenes, but their structure and properties are different and they are not considered to be alkenes. Each carbon of the double bond uses its three sp2 hybrid orbitals to form sigma bonds to three atoms (the other carbon and two hydrogen atoms). The unhybridized 2p atomic orbitals, which lie perpendicular to the plane created by the axes of the three sp² hybrid orbitals, combine to form the pi bond. 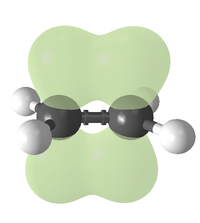 This bond lies outside the main C–C axis, with half of the bond on one side of the molecule and half on the other. A 90° twist of the C=C bond (which may be determined by the positions of the groups attached to the carbons) requires less energy than the strength of a pi bond, and the bond still holds. This contradicts a common textbook assertion that the p orbitals would be unable sustain such a bond. In truth, the misalignment of the p orbitals is less than expected because pyramidalization takes place (See: pyramidal alkene). trans-Cyclooctene is a stable strained alkene and the orbital misalignment is only 19° with a dihedral angle of 137° (normal 120°) and a degree of pyramidalization of 18°. The trans isomer of cycloheptene is stable only at low temperatures. For bridged alkenes, Bredt's rule states that a double bond cannot occur at the bridgehead of a bridged ring system unless the rings are large enough (8 or more atoms). The physical properties of alkenes and alkanes are similar. They are colourless, nonpolar, combustable, and almost odorless. The physical state depends on molecular mass: like the corresponding saturated hydrocarbons, the simplest alkenes, ethene, propene, and butene are gases at room temperature. Linear alkenes of approximately five to sixteen carbons are liquids, and higher alkenes are waxy solids. Alkenes can also be converted into alcohols via the oxymercuration–demercuration reaction or hydroboration–oxidation reaction. 1 2 3 Wade, L.G. (2006). Organic Chemistry (6th ed.). Pearson Prentice Hall. p. 279. ISBN 1-4058-5345-X. 1 2 3 Moss, G. P.; Smith, P. A. S.; Tavernier, D. (1995). "Glossary of Class Names of Organic Compounds and Reactive Intermediates Based on Structure (IUPAC Recommendations 1995)". Pure and Applied Chemistry. 67 (8–9): 1307–1375. doi:10.1351/pac199567081307. ↑ Barrows, Susan E.; Eberlein, Thomas H. (2005). "Understanding Rotation about a C=C Double Bond". J. Chem. Educ. 82 (9): 1329. Bibcode:2005JChEd..82.1329B. doi:10.1021/ed082p1329. ↑ Streiwieser, A.; Heathcock, C.H. ; Kosower, E.M. (1992). "11.6.G. Alkenes: Reacttions: Free Radical Additions". Introduction to Organic Chemistry (4th ed.). New York: Macmillan. p. 288. ↑ Wade, L.G. (2006). Organic Chemistry (6th ed.). Pearson Prentice Hall. p. 309. ISBN 1-4058-5345-X. ↑ Saunders, W. H. (1964). Patai, Saul, ed. The Chemistry of Alkenes. Wiley Interscience. pp. 149–150. ↑ Cram, D.J. ; Greene, Frederick D.; Depuy, C. H. (1956). "Studies in Stereochemistry. XXV. Eclipsing Effects in the E2 Reaction1". Journal of the American Chemical Society. 78 (4): 790–796. doi:10.1021/ja01585a024. ↑ Bach, R.D. ; Andrzejewski, Denis; Dusold, Laurence R. (1973). "Mechanism of the Cope elimination". J. Org. Chem. 38 (9): 1742–3. doi:10.1021/jo00949a029. ↑ Snider, Barry B.; Matsuo, Y; Snider, BB (2006). "Synthesis of ent-Thallusin". Org. Lett. 8 (10): 2123–6. doi:10.1021/ol0605777. PMC 2518398 . PMID 16671797. ↑ Vogt, D. (2010). "Cobalt-Catalyzed Asymmetric Hydrovinylation". Angew. Chem. Int. Ed. 49 (40): 7166–8. doi:10.1002/anie.201003133. PMID 20672269. ↑ Grutters, M. M. P.; Muller, C.; Vogt, D. (2006). "Highly Selective Cobalt-Catalyzed Hydrovinylation of Styrene". J. Am. Chem. Soc. 128 (23): 7414–5. doi:10.1021/ja058095y. PMID 16756275. ↑ Hilt, G.; Danz, M.; Treutwein, J. (2009). "Cobalt-Catalyzed 1,4-Hydrovinylation of Styrenes and 1-Aryl-1,3-butadienes". Org. Lett. 11 (15): 3322–5. doi:10.1021/ol901064p. PMID 19583205. ↑ Sharma, R. K.; RajanBabu, T. V. (2010). "Asymmetric Hydrovinylation of Unactivated Linear 1,3-Dienes". J. Am. Chem. Soc. 132 (10): 3295–7. doi:10.1021/ja1004703. PMC 2836389 . PMID 20163120. ↑ Ho, C.-Y. ; He, L. (2010). "Catalytic Intermolecular Tail-to-Tail Hydroalkenylation of Styrenes with alpha-Olefins: Regioselective Migratory Insertion Controlled by a Nickel/N-Heterocyclic Carbene". Angew. Chem. Int. Ed. 49 (48): 9182–9186. doi:10.1002/anie.201001849. PMID 20853303. ↑ Ho, C.-Y. ; He, L. (2012). "Shuffle Off the Classic Beta-Si Elimination by Ni-NHC Cooperation: Implication for C–C Forming Reactions Involving Ni-Alkyl-Beta-Silanes". Chem. Commun. 48 (10): 1481–1483. doi:10.1039/c1cc14593b. PMID 22116100. ↑ Zweifel, George S.; Nantz, Michael H. (2007). Modern Organic Synthesis: An Introduction. New York: W. H. Freeman & Co. p. 366. ISBN 0-7167-7266-3.